The Cornwall Caledonian Pipes and Drums is a non-profit making organisation formed in 2002 and is the first full Pipe Band from Cornwall to have been registered and accepted by the Royal Scottish Pipe Band Association. The band has gone through many changes over the years and is now regenerating with new members into a friendly group of musicians who play, basically, for the love of the music while raising funds for a number of national and local charitable causes. Apart from playing for our own enjoyment the Cornwall Caledonian Pipe Band has appeared at the Hall for Cornwall, plays annually at the Royal Cornwall Show, Wadebridge and assists in fund raising events for such charities as the Cornwall Air Ambulance, The Cornwall Hospice Care Trust, the 'RNLI', 'The South West Gurkha Trust' and 'The Cystic Fibrosis Trust'. We also give our time freely to play for the Royal British Legion and various Residential or Care Homes in the region for the enjoyment of the residents or to raise funds at their open days/fetes. We practice on a Wednesday evening in the Penryn area which is central to most of our present members. Anybody is welcome to come along and see what is entailed in learning the Pipes or Drums. All basic equipment is free as is the tuition. Anybody who has the ability and enthusiasm and has reached a good, basic level would be invited to join the band and would be kitted out (Free) with uniform from the band stock. The Band tartan is the Black Stewart being a military tartan. For formal or military events the kilt is usually worn as Full Highland Dress with white spats, tunic, hair sporran, plaid, feather bonnet etc. For non-military events or during the Summer months when it is hot the uniform is usually `Day Dress` with the Black Stewart kilt, argyll jacket, day sporran, shirt, tie and glengarry. 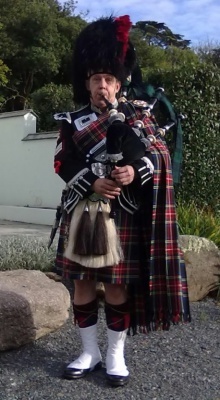 On casual occasions members of the band may wear different tartans - either their own family tartan or a national tartan such as the Cornish (shown here).